The social and political influence of courts has increased in recent decades. The expansion of judicial power worldwide raises important questions about who the judges are and what their role is. The workshop brings together scholars from different countries in order to address women's participation in judicial decision making processes in the Middle East and Africa. During the past decades, the appointment of women judges has increased in the Middle East and Africa. This increase, however, is only beginning to be reflected in socio-legal judicial studies where the perspective of women judges has been almost completely lacking with the exception of the pioneering socio-legal study by Bauer and Dawuni (2016) and Sonneveld and Lindbekk (2017). The proposed workshop aims to contribute to this burgeoning literature by undertaking a comparative study of women in the judiciary in the context of the Middle East and Africa and to complement, enrich and add new aspects to the comparative work on Gender and Judging, Women in the Judiciary and Gender and Judicial Education which Ulrike Schultz and Gisela Shaw have edited in the past ten years. The proposed workshop approaches the subject matter from two angles: First, judicial selection processes and subsequent legal careers; secondly, the workshop addresses gender aspects of judging. With regard to the first issue, a major argument used to promote gender balance in the judiciary is grounded in the question of democratic legitimacy. Further, both proponents and opponents of women working as judges argue that women are more empathetic and sensitive than men. While these presumed qualities could be regarded as a strength, they are also used to generate doubt about the suitability of women as judicial authorities and their ability to judge objectively. In Muslim-majority countries of the Middle East, opposition has been reinforced by arguments that the inclusion of women in the judiciary violates Islamic shari‘a. A majority of the classical scholars held that women’s deficient intellectual and religious capacities made them unfit for a position that involved imposing their decisions on others. Despite domestic opposition, the appointment of women judges in countries with a Muslim majority has been growing over the previous decade and a half. Similarly, several African countries have also witnessed significant strides in terms of women’s representation on the bench over the past twenty years. In the 1990s and 2000s, women in countries as geographically, legally, and politically diverse as Benin, Ghana, Lesotho, Nigeria, and Rwanda have taken on leadership roles as chief justice or president of the constitutional court. what is the role played by international pressure (UN Women, The African Union) combined with financial aid and assistance from (inter)national donor organizations in the appointment of female judges? What is the impact of different legal systems (often a mix of common law, civil law, local customary law and shari’a law) and government policies such as gender quotas on the subject matter? Are there differences in the said countries in terms of the number of female judges appointed as well as the type (civil vs. shari’a) and level (lower vs. appellate) of courts to which women are nominated? how do women perceive working in a previously male-dominated environment. Early scholarship on women judges was colored by essentialist assumptions about the difference women in positions of power should make. Rather than asking whether women judges offer a different voice, more recent scholarship on law and society theorizes the related notions of diversity on the bench, democratic legitimacy, difference, and representativeness through a gender lens. With the aim of generating systematic, comparative empirical research, the workshop provides an international platform for discussion between socio-legal scholars who have extensive knowledge on the subject matter in the Western world (Schultz) and outstanding academics on courts in the Middle East (Abou-Ramadan, Cardinal, Carlisle, Dahlgren, Lindbekk, Engelcke, Hellestveit, Maktabi, Moghadam, Shahada, Sonneveld, Voorhoeve, Welchman, Yassari) and Africa (Dawuni, Achnakech. Tønnesen; Ellett, Kang, Ibrahim, Masengu, Oxtoby). The major output from this workshop is the publication of a comparative book on gender and judging in the Middle East and Africa. 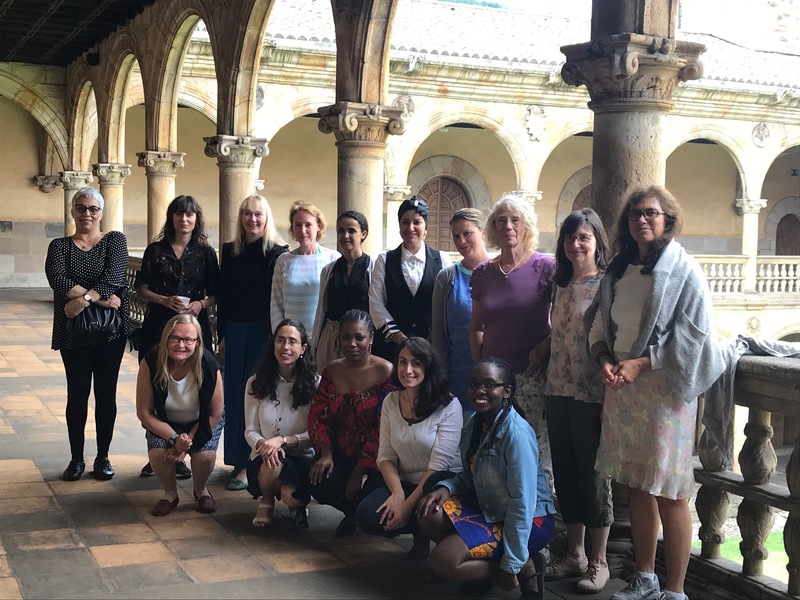 Between July 4th and July 6th the International Institute for the Sociology of Law in Oñati hosted the Workshop "Gender and Judging in the Middle East and Africa, Emerging Scholarship and Debates". The Workshop, coordinated by Josephine Dawuni (Howard University)- Monika Lindbekk (University of Oslo)- Rania Maktabi (Østfold Univesrity) and Ulrike Schultz (FernUniversität in Hagen), has provided for sixteen female scholars coming from different countries, backgrounds and academic fields the opportunity to join a fruitful discussion on Gender and Judging. The workshop addressed the constrains and challenges on the path towards female appointments to judgeship from an historical perspective, the political and theoretical debates that sorrounded such appointments and the impact that they have on local societies in the various contexts under analysis. The group discussion has been opened by Ulrike Schultz, who offered an overview on the past and present of European and International scholarly debates on Gender and Judging. After such an introduction, the first day of the workshop focused on the topic of “Gendered patterns in judicial selection processes”. The participants presented individual country cases from Africa and the Middle East. Presentations started with Mirjam Künkler (University of Bonn, Germany), who explored the Indonesian case. Rebecca Badejogbin (University of Cape Town, South Africa) joined the discussion via Skype offering an insight on the situation of women in African judiciaries. The perspective on Africa has been brought forward also by Tabeth Lynn Masengu (Human Rights Center, Ghent University and University of Cape Town) who addressed the specific situation of Zambian Women Judges, highlighting the problem of the persisting perception of illegitimacy towards female judges despite the high number of women sitting in Zambian Courts. The case of Zambia has been further developed by Rachel Ellet (Beloit College USA), who focused on the political debates that sorround Zambian and Malawi Judicial Selection and Promotion of female judges. Nijmi Edres (Georg-August-Universität Göttingen, Germany) presented the situation of Israel, where the first female shari’a judge was appointed in May 2017. Rania Maktabi (Østfold University, Norway) and Fatima Alhewail (Kuwait University) explored the case of the appointment of female judges in Kuwait. The second day of the workshop addressed “Gender aspects of Judging”. African case studies were presented by Anakech Getnet Ayele (Tilburg University, Netherlands) and Enibokun Uzebu (University of Benin, Nigeria) who addressed gender aspects of judging in Ethiopia and Nigeria. Maaike Voorhoeve (Universieit van Amsterdam, The Netherlands), Monika Lindbekk (University of Oslo, Norway) and Susanne Dahlgren (University of Tampere, Finland) focused their presentations of the cases of Tunisia, Egypt and Yemen. Nahda Shehada (International Institute of Social Studies, The Netherlands) presented a comparative analysis on the sociology of judging in Gaza and Damascus Shari’a Courts. Finally, Monique Cardinal outlined the dynamics of empowerment and disempowerment of women judges and prosecutors in Syria since March 2011.